FRESNO, Calif. (KFSN) -- A mother was reunited with her daughter on Friday, five days after she fought off an attacker on a Greyhound bus that held the child at knifepoint. She was released from the hospital earlier in the day, where she was met by a Tulare County Sheriff's Detective. That Detective personally drove the woman back to her home in Northern California to be reunited with her daughter. The Sheriff's Department posted these pictures of the happy reunion on Facebook. On Monday the woman and her daughter were on a Greyhound bus that was traveling from Las Vegas to Oakland. 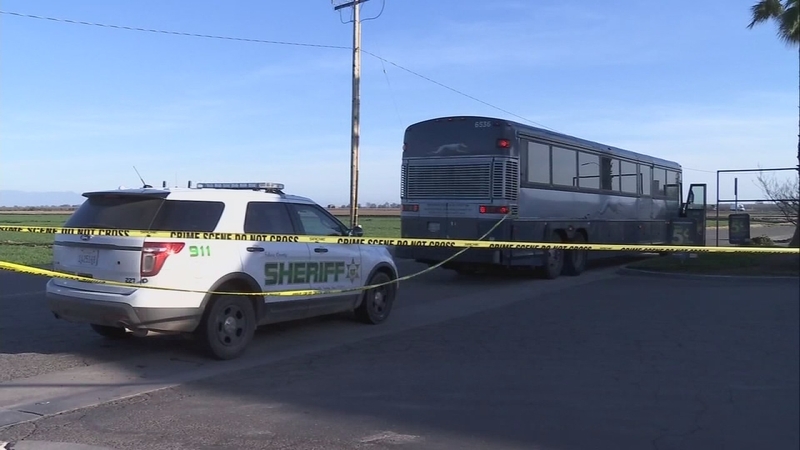 Along the way, the bus stopped in Bakersfield, where 58-year-old Teresa Madrigal boarded. As the bus continued on its journey, Madrigal is accused of grabbing the 3-year-old girl around the neck and holding her at knifepoint. When the mother tied to grab her daughter, Madrigal stabbed her multiple times, according to Tulare County Sheriff Mike Boudreaux. Passengers and the bus driver were eventually able to separate the girl from Madrigal. A total of five people were hurt in the incident, but none had life-threatening injuries.